Do you ever have one of those moments when you see something, a photo or a commercial for something, and all of a sudden your brain says, "You need that RIGHT NOW!" I had that moment today when reading The Black Apple's post about Walnut Bread. I didn't even KNOW I wanted walnut bread, and then I saw a photo and read a description and something clicked in my head and things weren't going to be right until I had some walnut bread. 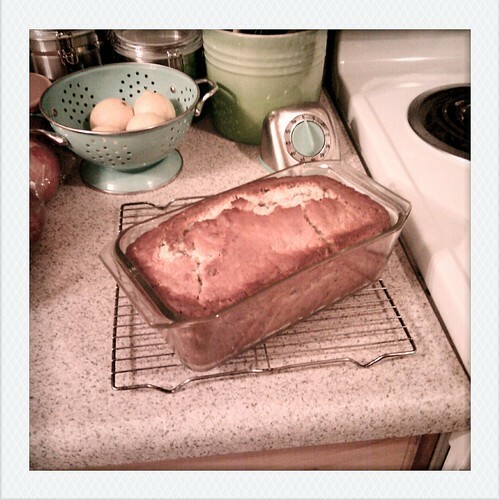 So I made walnut bread and it was done in time for me to devour a slice while watching the end of 30 Rock. That, my friends, is how you make Thursday AWESOME.